← What If I Died Tomorrow? Muhammad Ali was a local legend in southwest MI. The former heavyweight champion moved to Berrien Springs, MI towards the end of his boxing career in 1975. He owned an 85 Acre estate on just under a mile of the St. Joseph river. I currently live about 7 miles from the Ali home. 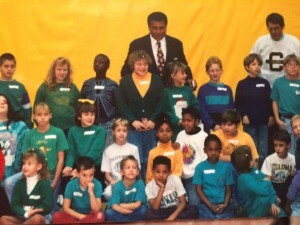 When I was a kid, I think I may have been in first grade, maybe second, around 1992, Muhammad Ali came to our school during a large assembly for the dedication of the new gym that was built for our school district. He talked and joked around with the kids and signed a couple boxing gloves that were given out to a student who won them in a drawing. Why did Muhammad Ali choose to live in a small farming community of under 2,000 people far away from the big cities that most celebrities choose to live in? 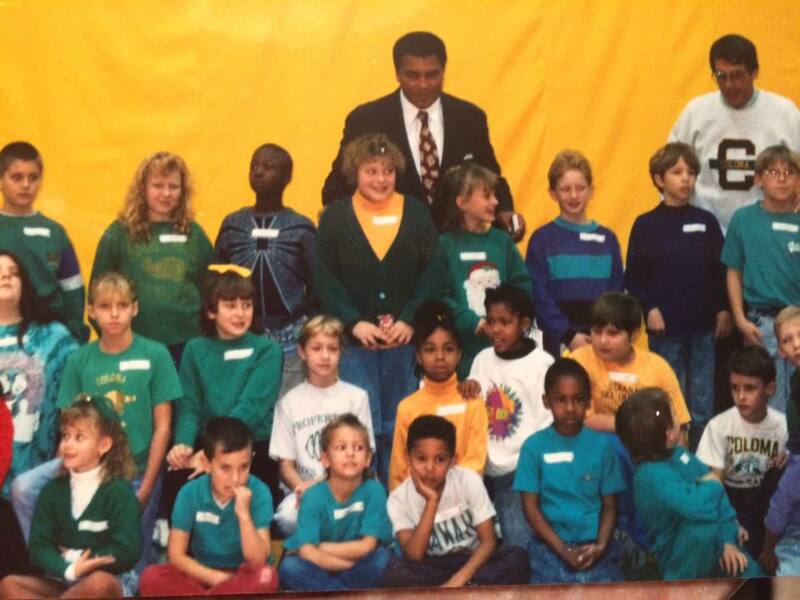 Why Did Muhammad Ali Live in Southwest Michigan? When looking at real estate, your money goes a LOT further in the Midwest. farming acreage tends to go for around $3,000 per acre. Although there is a premium to be paid for riverfront property, the premium was much lower in the 70s. It is believed that Ali originally paid $400,000 for the property. The St. Joseph river is no Lake Michigan, but the peninsula that Ali’s home is on provides privacy, water access, and stunning views. 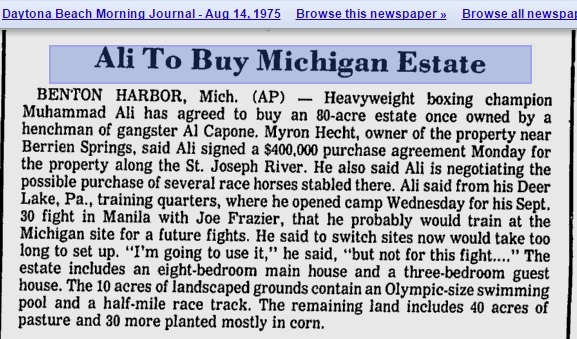 In 2003 Ali listed his home here in southwest MI for sale and started working on moving to Arizona to help with his Parkinson’s disease. He listed his property for $3.2 Million. According to current property records in our county the home is still owned by his wife. In an attempt to verify the original purchase price of the Ali home I looked up the deed in our county records. Unfortunately, the deed has the purchase price listed as one dollar, so this was no help. I then searched for the names of the people he purchased the property from and found this newspaper article from 1975 confirming the $400,000 figure. $400,000 in 1975 adjusted for inflation would be $1,778,892. The St. Joseph river is approx. 206 miles long and drains into Lake Michigan in St. Joseph, about 7 miles from Ali’s home. The river’s average width is around 300′. Michigan has beautiful summers and falls, and the sunsets over Lake Michigan can’t be beat. Some of the best fruit grown in the world comes from Berrien County, MI, and property prices are fairly inexpensive. If it wasn’t for our harsh Winters, southwest MI would be one of the most ideal places in the world to live. The 3 lots the Ali’s own have a total 2016 assessed value of $1,150,100. In Michigan the assessed value is half of the presumed market value, meaning the local assessor believes the property to be worth around $2.3 Million. Because of the limitation of Prop A, which limits yearly property tax increases to 5% or the rate of inflation, the Ali homestead has a total taxable value of $809,754. With a local millage rate for Oronoko township of 24.76 the Ali’s tax bill for this year would be $20,500 if it were their primary residence. Since they moved to Arizona, it is most likely not homesteaded, which would then add another 18 mills to their property taxes, bringing their yearly total to $34,650. For someone reported to be earning $4 million to $7 million per year, the property tax expenses for this property are very low. This is a very nice property, but not what you would expect from a celebrity of his status. His home would look very modest compared to the athlete’s homes we saw on the MTV show Cribs. By living in a low cost area he enjoyed a very nice secluded property, which afforded him a private life and the yearly fixed costs of it are much lower than what a higher cost home would be. Even though Ali was one of the biggest celebrities in American history, he was able to live a normal life here. After a while when everyone in a small town knows you, it is easy to live a normal life. In a larger city, I don’t think he would have had that option. I came across this article from 2007 when the Ali’s were moving to Arizona. The article shows some of the work they did to support our community. In reading articles about Ali in order to write this post one of my favorite quotes was published by our local radio host. Muhammad Ali demonstrated as much strength battling a debilitating disease as he did battling opponents in the ring. Keep in mind just because a fighter won that much money, doesn’t mean he gets to keep it. Adjusted for inflation, it looks like his highest payday was the 1975 Thrilla in Mannila fight, which would today be worth around $35 million. Boxers also pay a large cut to their managers and promoters. It’s highly likely that after paying those people and his taxes Ali walked away with somewhere around 25% of his winnings. I found a full list of prize fight money on an old message board, but I could not double verify its authenticity. The numbers appear to match up with the above totals I found in newspaper archives and clippings. I was unable to find exact figures on how much money Ali makes (or has made) from each individual deal. In the 1970’s Ali starred in a couple movies and made a few TV appearances. His two movies were the autobiographical The Greatest in 1977, and Freedom Road in 1979. Muhammad Ali received royalties from several books he has co-written or written, including his autobiography, The Greatest: My Own Story . Ali also gave paid speeches for a while, his profile is still on AthleteSpeakers.com advertising rates in excess of $100,000, the highest tier they have for speakers. Both his high celebrity status and his low frequency of speaking appearances help to increase the going rate. Both public speaking and endorsement deals were I’m sure hampered by his illness. I think if Ali had been in great health for the last 30 years he would have made a ton more money. While publicly refusing to be drafted to the Vietnam War Muhammad Ali was banned from boxing and stripped of his titles. The ban lasted for 3 and a half years in the prime of Ali’s boxing career. During this time period the prize fighter still need to earn some income. 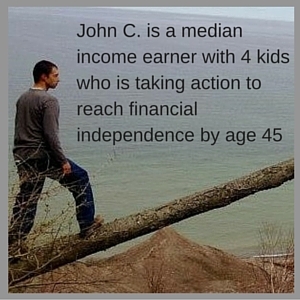 What would you do if suddenly your main stream of income dried up? Muhammad Ali gave speeches at colleges and even performed in a short lived Broadway musical. The really surprising source of income during these times was from Joe Frazier. Joe Frazier reportedly gave Ali financial help during this time period in addition to his help in publicly advocating for his reinstatement to boxing, despite their rivalry. Muhammad Ali is reported to be worth between $50 million and $100 million. His endorsement and licensing deal net between $4 million and 7 million per year. This does not include his 2015 deal with Under Armour. Ali managed all of his revenue from the use of his name, likeness, and trademarks through his company GOAT Inc., which was an abbreviation for ‘The Greatest Of All Time’. In 2006 Ali earned $50 million by selling 80% of GOAT Inc. to CKX. As with most celebrities tracking down their true net worth is fairly difficult because it is all private money. With CEOs and business owners it is much easier because the vast majority of their wealth is in publicly traded stocks and the amount of stock they own is a matter of public record. Muhammad Ali has struggled with Parkinson’s disease for over 30 years. He has been married 4 times and has several children. Although it is still too soon to know, I am hopeful that Ali did proper planning and that there is a will to guide what happens with all his wealth. It is also important that while we are living to sit down and let everyone know what they are getting and the rationale behind it. Such planning is the best gift any of us can give to our loved ones. It’s amazing to see how bitter and angry people get over even small amounts of money multiple parties feel entitled to when someone passes, I can’t imagine how bad they get when there are millions of dollars at stake. Multiple news articles are already anticipating a fight over his estate. If you were worth $100 million and world famous, what type of home would you own and where would you live? 3 Responses to "Muhammad Ali’s Money"
One of the greatest things about Stealth Wealth, which I intend to practice, is that you can anonymously support so many different projects. If I had that money and that fame, I would buy a house in my girlfriend’s hometown with enough acreage to support her extended family with some out-buildings. I hear ya! It’s unreal how much he made for that one fight. I bet if they decide to do a rematch he will make even more.